There are three major credit reporting organizations: TransUnion, Equifax and Experian. Each one is required to provide you with a free copy of your credit report on demand once every 12 months. Review them carefully and follow up immediately on any inaccurate or suspicious information. Many banks, credit cards and other financial institutions have begun reporting their customers' credit scores. This is a number between 300 and 850 that lenders use as a snapshot of your credit worthiness. It doesn't give you specific information, but a major downward swing can tip you off to a problem. Thanks to technology, payments no longer need to be submitted through snail mail. In addition to online payments, nearly every creditor now offers AutoPay, which lets you schedule specific dates and amounts. Late fees can add up, so having automatic payments is a weight off your shoulders. 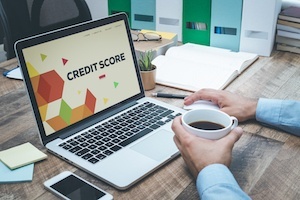 Your credit score is affected by your debt-to-income ratio, which shows lenders whether you're overextended. Maxing out credit limits will hurt, even if you're making payments faithfully. Aim for using no more than 30% of your available credit. Your favorite stores will tempt you with promises of discounts and other offers to get you to open a line of credit. Did you know that simply filling out an application affects your credit score? Lenders are wary of people who randomly acquire credit, fearing that they can end up over their head in debt. Have you already made a misstep or two? It happens to a lot of people, so our last two tips can help you get back on track. A prepaid credit card is something of a cross between a debit card and a traditional credit card. Once you're approved, you deposit money into your account and each purchase is deducted from the balance. The prepaid card won't actually improve your credit score, but it will help you control spending so you can repair your credit. A debt may not look so bad when you consider the minimum payment, but when those interest charges rack up, it's hard to get ahead. Make payments as large as you can afford to reduce debt quickly and save money on interest. All of our Springs luxury apartment communities offer online rent payment for your convenience. Our on-site management team is happy to answer any of your questions.